Evaluation should not be considered a stand-alone activity. It should rather be thought of as a set of linked tasks that are undertaken from the start to the end (and beyond) of a project. This is diagrammatically represented in the project evaluation cycle below. 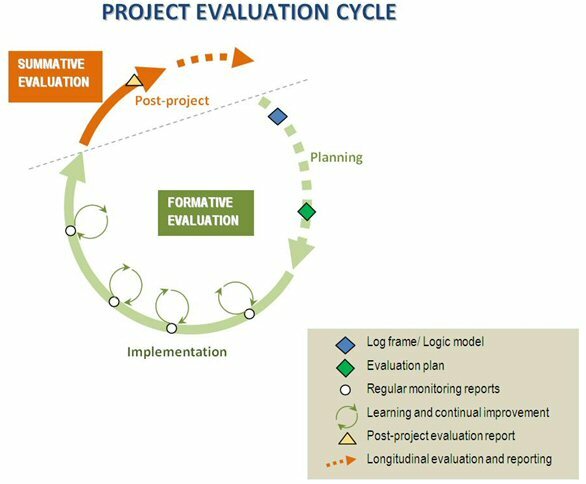 Just as there is a project management and project evaluation cycle, Willetts & Crawford (2007) have put forward a monitoring and evaluation data cycle that broadly outlines steps to identify, collect, analyse and use the data. 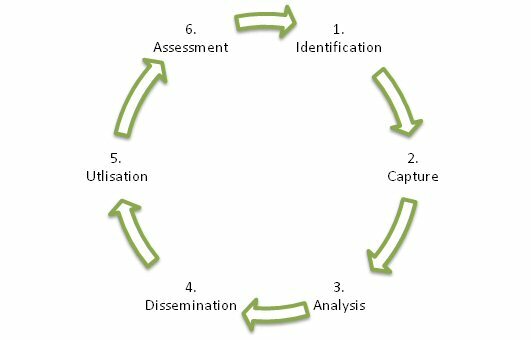 The monitoring & evaluation data cycle considers the process as having 6 stages (Willetts & Crawford, 2007: 368-369), as represented in the diagram below. Identification is the selection of the data required to achieve the purpose of M&E. This can be through defining indicators. Capture of the identified data. This can involve formal and informal ‘methods of enquiry’, and various stakeholders. Analysis of the raw captured data in order to draw out meaningful features and trends. Unless data are subject to some form of analysis, their capture represents a waste of time and resources. Dissemination of the M&E findings (analysed data) by various mechanisms to stakeholders. It is important to ensure that the information is relevant to the recipient, and is received in a timely and accessible format. Use of the M&E findings by the various stakeholders. Utilisation is embodied in the broad purpose of M&E: to promote learning and accountability. If the use of the data is not known from the outset, it is possible that it may remain unused, which would be a waste of time and resources. Assessment and reflection about whether the data identified in the first stage, having been captured and been put to use, has demonstrably contributed to improved learning and accountability. This is in essence an evaluation of the M&E system, and provides a means to make a judgement on what improvements can be made to the evaluation program.